LANSING, MI - Air Lift is expanding its load assist product line with the new LoadLifter 7500 XL(tm) series kits, which offer extreme load leveling capabilities. The LoadLifter 7500 XL is now Air Lift's heaviest-rated air spring kit, built to provide 7,500 pounds of load- leveling capacity. For owners of 3/4- and 1-ton pickups that tow or haul heavy loads like slide-in campers, 5th-wheel RV trailers or gooseneck flatbed trailers, this kit provides an unbeatable combination of adjustability and ride quality. This heavy duty air spring system provides a solution for vehicle squat, which can result from carrying heavy loads. By properly distributing weight to all four wheels, the LoadLifter 7500 XL maximizes vehicle stability while eliminating unsafe and uncomfortable driving conditions such as poor braking, unresponsive steering, trailer sway, body roll and bottoming out. This kit also smoothes out the formerly rough ride that could result from heavy duty towing and hauling. The massive 7-inch double-bellows air springs have been specifically designed to handle extreme loads and offer greater leveling at all pressures for a safe, stable and comfortable ride. Air adjustable from 5 to 100 PSI, the air springs keep vehicles stable, level and comfortable whether loaded or unloaded. The air springs are constructed with a reinforced two-ply fabric for maximum strength and long-lasting durability, and feature end caps made of light and ultra-strong corrosion-proof nylon composite. The LoadLifter 7500 XL kits come with Air Lift's exclusive roll plates, which protect the air springs from sharp edges and increase load capacity up to 10 percent. Many LoadLifter 7500 XL kits will require no drilling into the frame and install in three hours or less, and come with a fully illustrated instruction manual. For convenient inflation and deflation of the air springs, Air Lift offers automatic, wired and wireless on-board air compressor systems. All Air Lift products are backed by an industry-exclusive lifetime warranty that covers the entire contents of the air spring kit. The company also ensures product satisfaction with a 60-day no-questions-asked, money-back guarantee on all load support air springs and on-board compressor systems. 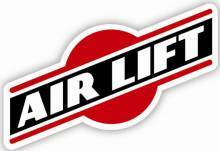 Air Lift Company, founded in 1949, is a third generation, family owned suspension specialty company based in Lansing, Michigan. Air Lift is committed to engineering, manufacturing and selling the highest quality suspension products that fit, work and last. Air Lift products are available at retailers across the country as well as internationally. For more information, contact Air Lift Company by calling (800) 248-0892, or on the web at www.airliftcompany.com/.